This article is about the district of Köln. For other uses, see Deutz. Deutzer Freiheit with Riphahn Building. Cologne-Deutz, often just Deutz (German pronunciation: [ˈkœln ˈdɔʏts], Ripuarian: Düx [dʏks]) is an inner city part of Cologne, Germany and a formerly independent town. 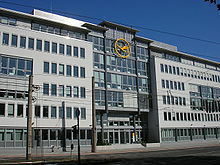 Lufthansa's headquarters are in Deutz. Deutz was established under Roman Emperor Constantine I in 310 AD, when he established Castrum Divitia, a military camp, built in on the opposite river bank of Colonia Claudia Ara Agrippinensium. Camp and city were linked via a bridge from the same time. During the Middle Ages, Deutz was an important centre of learning in medieval Germany. Up into the early Middle Ages it was known by the Latin name Divitia, from the 10th century as Tuitium. It was located on the right bank of the Rhine, opposite Cologne, which grew up on the left bank. In 1002, the old castle in Deutz was made a Benedictine monastery by Heribert, archbishop of Cologne, and the important abbey was home to many influential theologians, such as Rupert of Deutz. Permission to fortify the town was in 1230 granted to the citizens by the archbishop of Cologne, between whom and the counts of Berg it was divided in 1240. It was burnt in 1376, 1445 and 1583; and in 1678, after the Treaties of Nijmegen, the fortifications were dismantled; they were rebuilt in 1816 and finally razed in 1888. In 1869, Nikolaus August Otto and Eugen Langen moved their company NA Otto and Cie to Deutz, where the company was renamed to Gasmotoren-Fabrik Deutz (the "Deutz Gas Engine Manufacturing Company"). Arguably, this is the birthplace of the modern Otto-engine, precursor for all modern internal combustion engines. Deutz was formally incorporated into Cologne in 1888. Modern Deutz is the part of the Cologne city centre on the right bank of the river. The location of Deutz on the river embankment opposite the old town of Cologne, the district serves as an important business centre and transportation hub: next to the Rheinpark, the Cologne trade fair grounds, the Lanxess Arena and Köln Messe/Deutz station, there are a number of municipal and regional government offices based in Deutz. Politically Deutz is part of the administrative district Innenstadt. The painter August Lemmer was born in Deutz. ^ One or more of the preceding sentences incorporates text from a publication now in the public domain: Chisholm, Hugh, ed. (1911). "Deutz" . Encyclopædia Britannica. 8 (11th ed.). Cambridge University Press. p. 119. Wikimedia Commons has media related to Köln-Deutz. This Cologne location article is a stub. You can help Wikipedia by expanding it. This page was last edited on 24 December 2018, at 00:43 (UTC).